And A Player To Be Named Later: Is It Time To Get Concerned About Mark Teixeira? As of this writing, the well-paid, Yankee 1st baseman is batting .248—well below his .284 lifetime average, and a far cry from the .207 he hit in 2007. After batting .220 last year in September and October, Teixiera started —for him—fairly decently. Tex batted .256 and 6 HRs in April, not bad for a notoriously slow starter. Since then however, instead of warming up as the weather warms—again, normal for him—Tex has gone the other way. Batting .241 in May, including .226 for the past 14 days, Tex hasn't gotten much good wood on the bat lately. For instance, in the past 14 days, Tex's BABip is a pathetic .214. After hovering at about 20% for much of his career, Tex's LD rate has steadily dipped since 2008 to where it is now, at a lowly 15.0%. 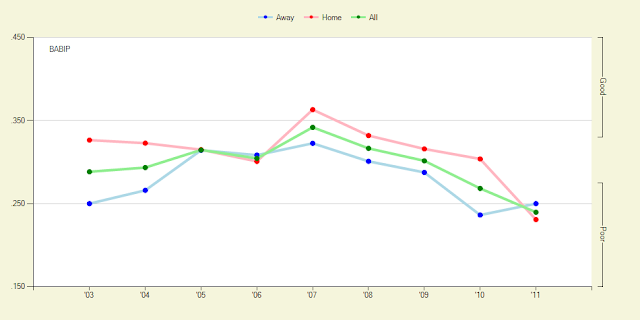 Conversely, his flyball rate has steadily risen from 36.5% in 2008 to a whopping 48.1% this season. Now here's where it gets interesting: Tex's lifetime rate as a LHB against a RHP is .275. Last year it was .244. This season it is down to .228. Couple that with the rise in flyballs and the question becomes: Is the Yankee Stadium's short right field seats getting to Teixiera? Is Tex trying to hit it over the short porch? Take a look at this chart from Fangraphs.com. 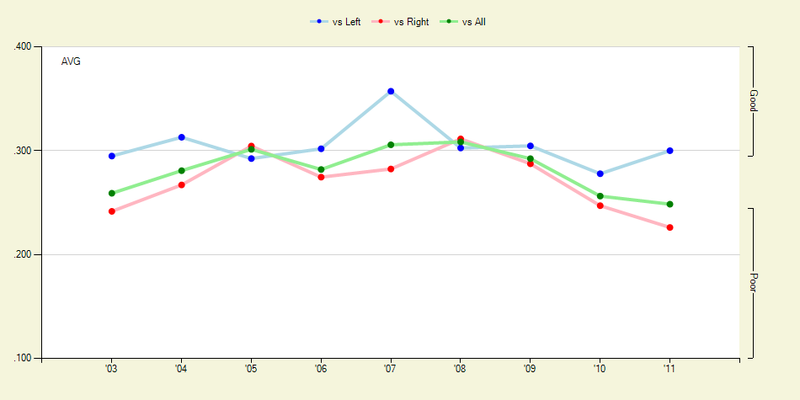 Particularly pay attention to the red line, or Teixiera's BA vs. righties. 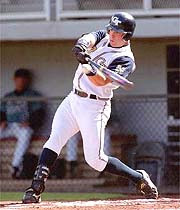 For a while in his career, Teixeira drove the ball and got hits. Now, Tex's career seems to be heading for the home run or bust, Dave Kingman territory (well maybe not that bad). After doing some research, it seems that The Captains' Blog wrote something similar not too long ago. The hypothesis of their article was just what we wrote above: "Despite establishing himself as a well-rounded hitter before joining the Yankees, Teixeira has gradually turned into a more one-dimensional slugger, particularly when batting from the left side." One wonders why that would be—his HR or bust numbers from the left side, and not the same from the right side? Could the short porch have something to do with it? ...except the swinging for the right field fences. Considering the other stats we know; Tex's plummeting line drive rate, his steadily increasing flyball rate, his dropping BABIP rate, as well as Teixeira's dropping fastball success rate and we can assume that Tex is swinging for the fences more. It's happened to other lefties who come into Yankee Stadium. They see the short right field seats and can't help themselves but to swing for it. And heck, Teixeira himself said it last year: "I have never played in a home before where the discrepancy was so great between center and right," Teixeira said. "So it is a constant battle every game [to not get pull crazy]. I do have 30, 40, 50 at-bats here a year where I go back to the dugout and think, 'I am trying to pull too much." And it shows. He's putting almost everything he hits from the left side in the air to right field (as well as a ton of slow grounders to the right side as well). All but 2 of his homers are to right field, regardless of park. Is the swing getting more uppercut and pull-oriented? This isn't the first time Tex has had his lefty swing down in the .220's as a Yankee. During June and July of last season, Kevin Long worked with Texeira to try to fix his lefty swing—not his righty swing, just his lefty. It worked for a little while—it got Tex's LHB vs. RHP up to .244 by season's end. Not good, but a smidge better. But this season, he's back to not getting good wood on the ball as a lefty—the flaw in his swing is back. However, whatever the mechanical flaw, there is still the underlying cause of why is Texeira failing against righties when he batted .311 against RHP in 2008, the season before he became a Yankee? Itsabouthtemoney.net wrote recently an article entitled "Don't be concerned about Teixeira." I respectfully disagree. As the stats they point out, when you look at them as trends, you have to draw the conclusion: Worry, not yet. Concern. I think so.